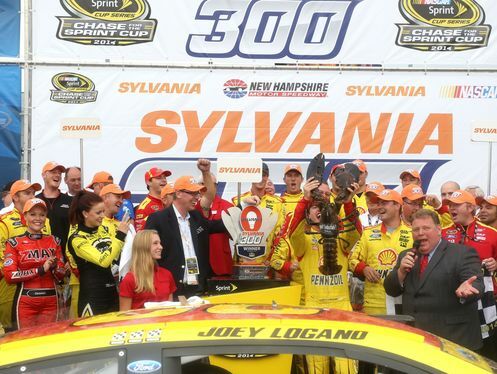 A Sprint Cup trend is turning into Sprint Cup fact. 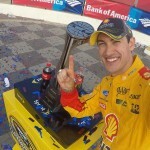 With Joey Logano’s win at Sunday’s Sylvania 300, it marks the 19th win by Team Penske or Hendrick Motorsports this 2014 Sprint Cup season. That’s now 67.8 percent of the races for those counting. While the winner seems predictable, this Nascar recap shows other winners and losers from the weekend. Eight drivers are within 12 points of each other at the bottom of the standings. Nobody, not even AJ Allmendinger and Aric Almirola are out of contention yet. This makes each race relevant and each lap meaningful for nearly half the field. 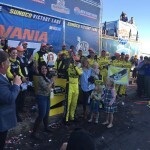 Fans saw that at New Hampshire Motor Speedway on Sunday. The racing was great. This is what Nascar wanted. This is what Nascar is getting with the new format. Darian Grubb told Halmin to “Keep your mouth shut”over a fuel issue. Hamlin wrecked with a teammate. Hamlin is still mathematically alive to win the Sprint Cup, but I would seriously take Almirola before Hamlin at the moment. Hamlin hasn’t been the same since not taking home the title at Homestead what feels like forever ago. Promised crew chief changes can’t come enough for the entire Joe Gibbs Racing team. The good news is Jimmie Johnson finished fifth. Dale Earnhardt Jr. finished ninth. Kasey Kahne remains in contention in spite of a 22nd place finish. Jeff Gordon still looks safe after finishing 26th. Two races into the Chase, none of the four Hendrick Motorsports cars look like they’ve taken an extra step to win a title. There are still eight races to make it work, but Team Penkse shows no sign of slowing down. At what point does this winning streak turn into something not even Rick Hendrick can overcome? Teams travel to Dover in the next stop on Nascar’s playoff circuit. Enjoy planning for the Monster Mile, and insert a random catchphrase here.